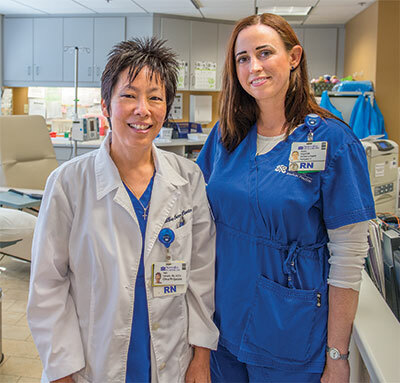 Keni Horiuchi, R.N., left, and Becky Haywood, R.N., guide patients through their cancer treatment. A cancer diagnosis can bring mind-numbing disbelief, anxiety and a barrage of questions, usually starting with, “Now what?” Ready to help steer patients through the medical and emotional maze that ensues are NorthBay Cancer Center nurse navigators. Becky Haywood, R.N., helps breast cancer patients get through the system of diagnostic imaging, diagnosis, and surgery, and coordinates post-surgical referrals to physical therapy and to medical oncology if needed. “Being a navigator means being an advocate, teacher, listening ear, nurse, resource and coordinator,” Becky says. Keni Horiuchi, R.N., is a breast care and oncology certified clinical nurse specialist and nurse navigator. She provides navigation services to any patient who has a cancer diagnosis and is receiving care through a Cancer Center oncologist. Being a navigator means being an advocate, teacher, listening ear, nurse, resource and coordinator. The operative word in her title, “navigator,” says it all. “Our patients are overwhelmed at first, but I am here to help guide them through the process. I also help coordinate care from different providers, different departments and sometimes even outside the NorthBay system,” Keni says. She can answer most questions patients and their families have related to a cancer diagnosis, and keeps an open and ongoing communication with the physicians, social workers, and other members of the healthcare team about the patient’s needs. Although she is not a navigator, Nurse Practitioner Maricel Roblez supports patients with symptom management during the treatment process and guides them into recovery as part of NorthBay’s STAR Program (Survivorship, Training and Rehabilitation). Patients are referred to the program by their oncologists following treatment, and with Maricel’s guidance, they journey to their “new normal,” where recovery and survivorship begins. Maricel makes sure her STAR patients see physical therapists to increase strength or endurance, social workers or mental health counselors if they are dealing with stress and depression, and, if they have had head or neck cancer surgery, speech and language pathologists to help regain voice or swallowing abilities. “My patients are already seeing the side effects of their cancer treatments and my focus is on symptom and pain management,” Maricel explains.